Stadium Financing 100% Publicly Financed (federal government, Ontario provincial government, the City of Toronto, and a large consortium of corporations). 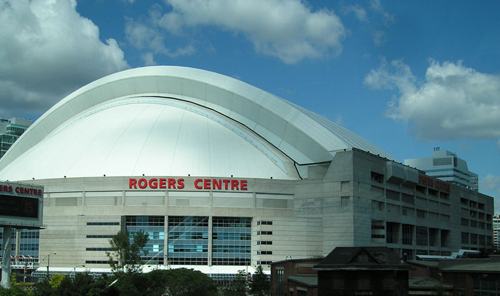 Naming Rights Rogers Communications, paid $25 million for the naming rights beginning in 2006. June 22, 1995 SkyDome had two wood tiles from an upper deck fall onto spectators during the Blue Jays' game against the Milwaukee Brewers. At least seven people were injured when the panels fell 40-50 feet from the facing of the fifth deck to the crowd below. 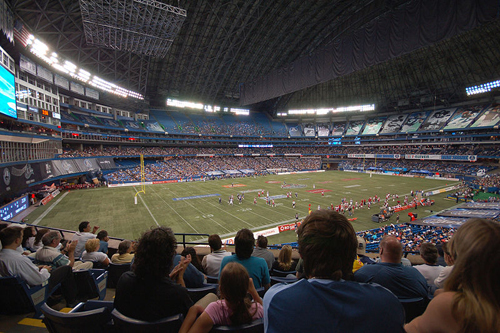 The new owners of Toronto's SkyDome have dismissed Lawrence Dale as president. Dale worked for Sportsco International Inc and was instrumental in pulling together the deal that created the company and made its purchase of the venue possible. The company will be run by Harvey Walken and Alan Cohen who hold a total of one-third of the company's equity. Dale has between five and 10% equity in the company. Sportsco also hired Michael Downey away from Maple Leaf Sports and Entertainment this week to become the SkyDome's new vice president of marketing. Reports suggest Dale's departure was necessary for Sportsco to make a proposal to buy the Toronto Blue Jays from LaBatt Brewing Co. The Jays are the venue's major tenant and LaBatt bid against Sportsco to buy the stadium out of bankruptcy. Ill feelings between Dale and LaBatt have reportedly blocked earlier efforts by Sportsco to buy the team. Howard Milstein, who is part owner of the New York Islanders, is also reportedly interested in the team. Milstein has also made proposals to buy the Washington Redskins and the Pittsburgh Penguins. He also bid for the Cleveland Browns. Sportservice Corp is reportedly close to buying concession right at Toronto's SkyDome from McDonald's Restaurants of Canada. SkyDome's new owners are planning a host of new amenities in an effort to attract new customers, including one of the most sought-after benefits of all - lower prices. Among the items being considered are billiard or pool rooms, a barber that can provide in-suite service or a cigar lounge. There might even be a supervised playground where children can play while their parents enjoy a Blue Jays game. The cost of the work is estimated at CAN$50,000. The venue's new owner, Sportsco, will reduce annual prices by at least 6.6% with prices going to CAN$70,000 to CAN$210,000, not including tickets. The suites now lease for CAN$100,000 to CAN$225,000. Tickets run up to CAN$57,000 additional. The number of suites could also be reduced from the current 161 to 120 to increase demand. Lawrence Dale, the former president of Sportsco International, wants to force his former company to sell Toronto's SkyDome to him. Dale has gone to court asking that his former partners, Harvey Walken and Alan Cohen, along with five other companies, sell him the venue less any profits they have received. That would make the purchase price CAN$80 million, the same amount the company paid to buy the venue out of bankruptcy. Dale worked for Sportsco and was instrumental in pulling together the deal that created the company and made its purchase of the venue possible. The company is run by Walken and Cohen who hold a total of one-third of the company's equity. Reports suggest Dale's departure was necessary for Sportsco to make a proposal to buy the Toronto Blue Jays from LaBatt Brewing Co. The Jays are the venue's major tenant and LaBatt bid against Sportsco to buy the stadium out of bankruptcy. Ill feelings between Dale and LaBatt have reportedly blocked earlier efforts by Sportsco to buy the team. Clients holding leases on 161 suites at Toronto's SkyDome have been slow to renew with only a few signing new agreements. The 10-year leases expire in two months. Problems include higher than expected competition from the new Air Canada Centre. SkyDome officials plan to cut prices and change their marketing strategy in hopes of filling the suites. The venue had been 85% leased at prices ranging from CAN$100,000 to CAN$225,000, not including tickets. Officials recently contacted for updates to the Revenues From Sports Venues directory indicated pricing would be undergoing a major change and would not be available until mid-November. The Air Canada Centre, which opened earlier this year, has 160 suites which lease for CAN$59,000 to CAN$160,000, including tickets to both the NBA Raptors and NHL Maple Leafs. Air Canada Centre suites have 12 to 16 seats, as do the SkyDome suites. SkyDome officials have hired International Management Group (IMG) to help invigorate sales. Venue officials are also considering shorter term leases and play rooms for children and lounges for billiards and cigar smoking. Lease sharing may also be available. May 31, 1998 - When this stadium opened in 1989, it was billed as an architectural marvel, and the trend setting design for the MLB ballpark of the future. Imagine an edifice with a fully functioning retractable roof, a hotel built right into the facility, with rooms overlooking the field. Multiple restaurants and dining options, again with views of the action. 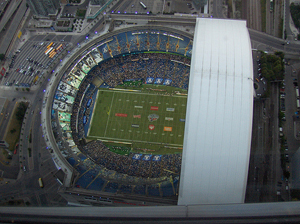 Skydome, if you will, was heralded as the ultimate sports venue of the future. But - shortly thereafter baseball was treated to the opening of Camden Yards in Baltimore, and it was this retro design that captured the hearts and fancy of baseball fans, and it was this formula that was universally adopted during the construction boom of the 90s. 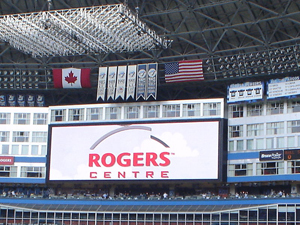 Today the renamed Rogers Centre stands as a unique original, and the Blue Jays' new owners, Rogers Communications is implementing huge upgrades and renovations to keeping this stadium an exciting and pleasant place to enjoy the game of baseball. 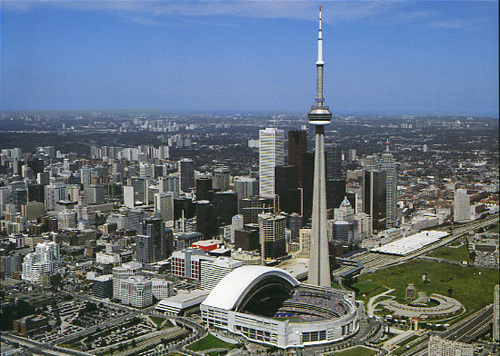 The Rogers Centre is located right downtown, and right next door to the landmark CN Tower, and is also easily visible off the Gardiner Expressway. Traffic in Toronto is almost always congested, so always allow extra time to get anywhere you need to go. Parking for the Rogers Centre means checking out the myriad of private lots scattered across downtown. Expect to pay anywhere from $15 to $20 near the venue, although prices tend to change depending on what else is going on in the city or who the Jays are playing. Free street parking is almost impossible to find, as the City of Toronto has upgraded to those newfangled kiosk meters where you buy the ticket and put it on your dashboard ($1.50/hr). We have scouted out a good lot on Wellington, right off Spadina, where the fee runs $5, and just a 10 minute walk to the stadium. Other options are the GO Trains which run all the way to Oakville, or the TTC subway, with the Union Station stop just two blocks away off of Front St.
Toronto is an amazing and bustling city, and the Rogers Centre is right in the middle of it all. On the north side is Front Street, and endless choices of restaurants and eateries await. Just two blocks north of there is the Theatre District, with yet more places to check out. Of course, the CN Tower is a destination venue in itself, and that is right next door. On the south side of the stadium just the other side of the Gardiner is Queens Quay, with tons of waterfront attractions and restaurants. High rise hotels are in abundance, and the neighborhood outside Rogers Centre has had spectacular growth in recent years, with high rise condo towers dotting the skyline. Around the outside of the stadium are numerous public plazas and gathering areas, and on a warm day, many entertainers and street vendors can be found and it is a great place to just sit and people watch. The Shopsy's vending carts can't be beat - a massive sausage served on an egg roll with plenty of toppings available ($4). The building is laid out into three levels 100 200 and 500. (300 and 400 levels are suites levels). In 2005 the team began a massive renovation of the concourses, and in the 100 level the top couple rows of seats were remover to improve the width of the concourses and view of the action on the field. New polished terrazzo tile flooring, ceiling tiles and lighting, a continuous row of murals interspersed with ads, plasma TV screens and festive concession canopies have given the corridors here a fresh new look. We hear that the outfield and skydeck concourses are due for the renovation treatment in the future. Access from lower to upper decks is via ramps only - no escalators so have your walking shoes on! Another interesting feature in the main concourse is the addition of non baseball related retail outlets, including a video store and wireless telephone outlet, both located next to a new team store. There shops open to the outside on non game days. With a capacity of 50,000 seats, this is a pretty big stadium, and the Jays have tried closing off outfield areas and tarping them in recent seasons to try to shrink capacity. The seats are all blue, and the panorama of the outfield is quite distinctive - the three restaurants, the windows of the hotel rooms, and a massive video board the centerpiece of it all. Speaking of scoreboard, the Blue Jays have done terrific upgrades to their seating bowl electronic amenities, starting with replacing their Jumbotron with a state of the art Daktronics video board. Two large screens on the outfield fences display out of town scores with detailed in-game information, and thankfully, they ditched the harsh green background with a black one, much more pleasing to the eye and we're sure better for the players. Ribbon LED boards fan out along the suite level balcony which add a lot to the special effects. Our good friend from Toronto Carol McLean once referred to the food at Skydome as ballpark dreck. Thankfully, new ownership has also made some improvements both to the concession stands and the product being served. Don't let all the fancy names on the concession canopies fool you, the offerings at all the stands is pretty much the same, but down in the 100 concourse one can find a cheese steak stand and corned beef carvery, with the sandwiches prepared before your eyes. In the old days when Interbrew SA owned the team, Labatt's was the only beer available but today one can find a wide selection of beers. The main team store is on the infield 100 concourse, though there are plenty of merchandise kiosks scattered throughout the building. There are three restaurants in the outfield overlooking the field, though keep in mind that access to these facilities is from the outside only. Windows, Sightlines and a Hard Rock Cafe all accept reservations for table seating and a great view of the game. The Jays have also renovated their 200 club level, establishing a "Club 200 VIP" with in seat waiter service, upgraded decor, table areas with views of the field. Top rows of seats have also been eliminated on this level to increase concourse space. The 300 and 400 levels are exclusive suite levels, including a super suite which can accommodate up to 350 guests called the ".400 summit". The Jays have won 1992 and 1993 World Series Championships, and they fly proudly next to their divisional championship banners. The CFL Toronto Argonauts also list their league titles. The Blue Jays have established a ring called "Level of Excellence", right along the 500 level balcony, which lists their all time greats. Players George Bell, Dave Stieb, Joe Carter, and Tony Fernandez are joined by past team president Pat Gillick, former manager Cito Gaston and legendary broadcaster Tom Cheek. song! The traditional "Take Me Out To The Ball Game" is added on during the 7th inning stretch. Home Run - To Blue Jays Media Relations Director WILL HILL, who has always accommodated us for our Artvoice media assignments and is generally just a nice guy. Will is an inductee in the USRT Hall of Fame. Home Run - For a well appointed Jays Kids Zone in the 200 level outfield, yet another nice new amenity for the fans. Home Run (times 4!) - On September 25, 2003, Blue Jays slugger Carlos Delgado became just the 15th player in MLB history to hit four home runs in a single game, in just four at bats, no less! And yes, the USRT was in the building!!! Error - Sidle up to the ticket window at Rogers Centre with your nine beans in hand, and you will actually be charged $11 - "Two dollar convenience fee". So WHERE exactly can one buy this ticket for the published price? Error - Thinking of sliding down to better seats in the later innings??? Forget about it! The sphincter police here are among the savviest and toughest of any sports venue, although at least you will always be treated with that exquisite Canadian politeness. "Votre billets, si vous plait? Eh?" Hit - To the Skydome Renaissance Hotel built right into the north side of the stadium, unique in the four major sports. Home Run - To the Toronto Star sponsored "Season Pass"... Get this: for $81 (plus a service fee) you get a pass which gets you a skydeck seat (redeemable day of game only) to ALL 81 home games. Are you frikkin' kidding!!!??? Home Run - Toronto seems to be a good common meeting ground to hook up with fellow famed road trippers, including Gary Herman/Mike "The King" Casiano from NYC, Jim Waddell and his posse from Montana, and Sean MacDonald and friend Aya from Tokyo. If you are a first time visitor, you will be impressed - overwhelmed is more like it. The Rogers Centre is really a pretty neat place to take in a baseball game, large, yet in its own quirky way, really intimate. The electronics and scoreboard are superb, the in game entertainment above par, and the building really is kind of a neat place to experience. And don't forget, a world class city lays right at the doorstep, with so much to see and do here, and an energy in the streets, the neighborhoods and the downtown business district that you can really feel. This is the closest MLB venue to our home base in Buffalo, so this is a trip we make several times each summer. No need to twist our arms to do a Blue Jays game... we will return again and again! Buffalo, N.Y. - Toronto-based Rogers Communications has made no secret that it wants more Buffalo Bills games played in Toronto. The Bills are always looking for more money. So it's not surprising the two parties are exploring the possibility of expanding the team's presence in Toronto, as early as the 2010 season. The Bills confirmed Rogers' interest in taking a second regular-season Bills game to Toronto for 2010, 2011 and 2012 - a move that, if approved, would have the team playing 25 percent of its home games away from Ralph Wilson Stadium. The Bills and Rogers Communications already have a deal that sends eight games - five in the regular season and three preseason from 2008 to 2012 - to Toronto for $78 million. That's $9.75 million per game. Last Dec. 6, the day before the Bills-Miami game in the Rogers Centre, Phil Lind, vice chairman of Rogers Communications, tipped his hand about Rogers' interest in more games for Toronto, while commenting on the National Football League's possibly adding a 17th game to each team's schedule. "Absolutely we're going to go for that game, if it happens," he said. "We're going to look for that one and maybe another one." Regardless of the prospect of a 17th game, Lind made the intentions of Rogers Communications clear: "Generally speaking, am I open to a game or two more?" Lind said. "Yes." A Bills source indicated that Rogers Communications, which had a tough time selling out its two games last season, went to the Bills to ask for more games and that the Bills were agreeable to the idea of Rogers polling its customers. The benefit to Rogers, besides increasing its stake in the NFL, would be to earn a bit more profit if it paid the Bills less for the additional games. The $9.75 million figure for the average Bills game in Toronto represents a windfall profit for the team, or roughly twice what the Bills can gross even from a sold-out game. The team can realize about $3.8 million in gross ticket sales for an average home sellout in Orchard Park; additional game-day revenue increases that to about $5 million. So the Bills, if they want to help out their business partner in Toronto, still could make a profit by selling another regular- season game each year to Rogers Communications for anywhere between about $5 million and $9.75 million. Those extra games at a lower per-game price would be a renegotiation of sorts, taking into account the difficulty of selling tickets in Toronto last year, the weakening of the North American economy and the further softening of the Canadian dollar. Information available online claims the proposed three-game ticket package for 2010 - two regular-season games and one preseason - would include "a lower price per game than previously, for most seats." Erie County Executive Chris Collins wouldn't be opposed to letting the Bills play more games in Toronto. "I'm supportive of anything we need to do to keep the Bills in Western New York," Collins said, endorsing the team's strategy to strengthen its appeal in southern Ontario. "The key to keeping the Bills in Western New York is making the team more valuable for whomever the owner ends up being," he said. Bills Chief Operating Officer Russ Brandon, at the NFL owners meetings in Dana Point, Calif., said he would prefer to let the team's official statement speak for itself. Toronto, Ontario - CBC News says Toronto Mayor Rob Ford hopes to bring a National Football League franchise to the city. Ford, well-known for coaching high school football, and his brother Councilman Doug Ford told the news service that four groups have approached city hall with hopes of bringing a team north. The 32-team league currently only plays in the U.S., although Toronto's Rogers Centre has been home field for the Buffalo Bills for some games during the past two seasons. Toronto has made attempts to bring a team to the city in the past, most notably in 1989 and 1995 when a group led by Paul Godfrey made a bid for a team. "The NFL cannot ignore the fourth-largest market in North America," Doug Ford said. Ford said a new team would require bigger stadium than the Rogers Centre, which can seat 50,000. But he said no local taxpayer money would be spent on a potential new stadium. Toronto is already home to the Argonauts, a Canadian Football League franchise. The Argos are the oldest pro football team in North America, having been founded in 1873.